Goats Eat Poison Ivy? Yes they do! Children’s Garden Educator Kristi Orcutt with Solstice, a baby pygmy goat. I thought you’d enjoy this video of 9-day old Solstice is showing off her stuff last week on the hillside behind the Conservatory — scroll down to see it! Earlier this week she took her first bite of solid food (grass), but as she turns into a bigger eater, she’ll help her mom with vegetation management here at Lewis Ginter Botanical Garden. Using goats in is an eco-friendly alternative to using herbicides to control vegetation, and is especially helpful on steep banks (where the goats have been eating blackberries bushes), in remote wooded areas (where goats munch on poison ivy, kudzu, bamboo and other invasive plants), and along the edge of our irrigation lake. 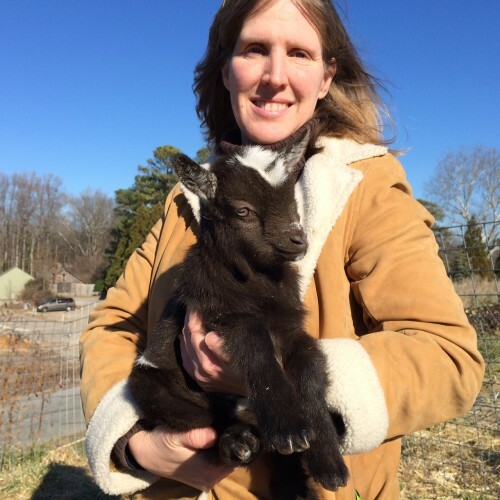 Solstice and Baby are owned by Children’s Garden Educator Kristi Orcutt, and demonstrate the Garden’s commitment to using sustainable and environmentally friendly options everywhere we can. Anytime we can show the home gardener an easy chemical-free way to solve a gardening challenge, we consider it a win. Since our mission is education, sharing how we use the goats makes sense. Orcutt tells me that it takes three “applications” of the goats eating down an area before you can expect the plant won’t return. But those three applications are also more effective than the chemical alternatives. The goats have been working at the Garden for several months now, but you aren’t likely to see them, since our “wild” areas at the Garden are off the beaten path. The Garden pays Orcutt a fee for their use. The goats also leave a trail of fertilizer that will help enrich the soil with nutrients, helping the non-invasive plants that remain.